Are you interested in using argument-driven inquiry for middle school lab instruction but aren’t sure how to do it? You aren’t alone. Argument-Driven Inquiry in Life Science is a one-stop source of expertise, advice, and investigations, with the information and materials you need to start using this method right away. The book includes 20 field-tested labs that cover molecules and organisms, ecosystems, biological evolution, and heredity. They give your students an opportunity to design their own methods, develop models, collect and analyze data, generate arguments, and critique claims and evidence. 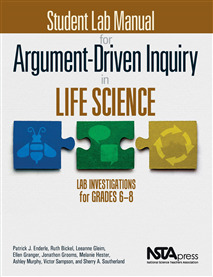 Student Lab Manual for Argument-Driven Inquiry in Life Science provides the student materials you need to guide your students through these investigations. With lab details, student handouts, and safety information, your students will be ready to start investigating.